HGTV star and professional property flipper Johnathan Scott is well accustomed to making design dreams come true for homeowners who have champagne taste on a beer budget. Embellish prefab cabinets. Create the illusion of custom cabinets by starting with inexpensive prefab cabinets. From there, add stylish hardware pulls, install a light rail underneath the uppers or add crown molding details around the edges. Each creates the illusion of custom cabinetry—even if you bought those puppies on closeout at your local home improvement store. Adopt a two-tone color scheme. A two-tone color scheme can infuse your kitchen with upscale vibes. (Think black cabinetry with a glossy white island.) It’s a simple and sophisticated color palette trick that lends creative vision and instant design cred to kitchens of any size or configuration. Pick a correlating backsplash. Check out backsplash ideas at your local home store. While they can run the gamut from minimalist to elaborate, stay on or under budget by selecting a simple backsplash that adds a touch of quiet elegance and complements your two-tone color scheme. Install statement lighting on the cheap. 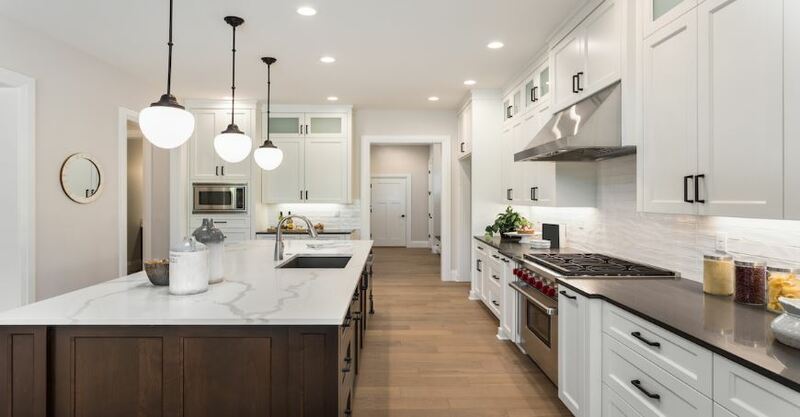 Lighting is one area where there can be huge price differences between fixtures that basically look the same, especially when it comes to glass globes or kitchen chandeliers. Instead of shelling out big bucks for designer lighting fixtures, trust that the “copy cats” will add the same look of luxury to your kitchen despite their lower price tags. For a touch of added glamour, install dimmers. These tips can help you increase the value of your home for an affordable price, giving you long-term benefits for when it’s time to sell.